A question is asked, “What are the qualities or characteristics that I attribute to a successful leader in the nursing field in today’s ever-changing healthcare landscape?” * Well, some things are unchanging. Patients are still dying, and nurses are still providing care. 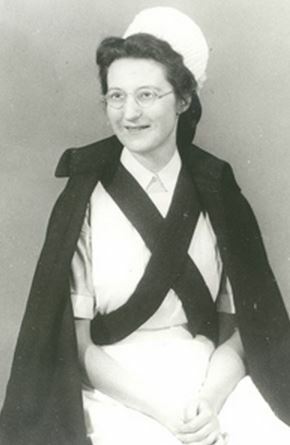 Dame Cecily Saunders (image here), the founder of the modern day hospice movement, epitomized the essence of hospice nursing when she said, “You matter because you are you, and you matter to the end of your life. We will do all we can not only to help you die peacefully, but also to live until you die”. This is not idealism, but what those of us who work in end of life care consider our mantra. A career in nursing has taught me the importance of mentoring the next wave of nurses, for them to be leaders in the area of nursing that has defined our own nursing specialization. We bring much more than knowledge. Have we, those nurses who are considered experts, learned the most important lessons? Lesson 1. Listen. I still remind myself, often, that I should listen more deeply. Do I hear the real concern that a patient is saying when he tells me, “I don’t need that yet”, refusing the hospital bed that he knows will be his final stand in the dying battle? Or what the spouse is expressing, as she tells me she doesn’t want to give the morphine to him, because she is worried about drug addiction? The answer is not, “We don’t worry about that”… the answer is to really hear her, and understand that she worries it will be the final dose, and she worries that she will walk into his room, and he won’t be breathing anymore, and she worries about what she will do when he is gone. Lesson 2. Love. I used to keep a note on my desk, “Love what you do.” My advice, always, to someone considering nursing as a career path, is to have a passion for it. Only go this route if you are motivated internally to change the world, think big, and want to “help people”. Oh yes, patently idealistic and unrealistic, but please don’t just choose nursing as a profession from a list of things you could do… let it choose you. Plan to never extinguish the light that burns, that we call inspiration. This is what makes brilliant nurses. And you will need tremendous love and sincere caring, when a person is covered with vomit and the stench of their unwashed body makes you shudder, yet you know you can wash them and provide medication, and sincere compassion, and alleviate some of the suffering that is part of being human. Lesson 3. Be. My patients have taught me the most important part of what I bring to them, with all my experience and expertise, is my presence. Who I am, at the bedside, is much more than my technical abilities and knowledge base, it is the essence of what makes me a hospice nurse. I am their midwife in this experience that is dying. I am able to come along side and bear witness as a life is ebbing, hopefully bringing solace to a patient and to their loved ones, during the most difficult time of life. Yes, I know some things about positioning a person who is now bedbound, and how to provide good skin care, and how to create a relaxing and peaceful environment, showing families how to speak quietly and lovingly when a person appears no longer responsive, and what medications are effective as their breathing becomes ragged or the nonverbal signs of pain are evident, or the angst of dying has created pain that no medication can cure. I hope all the leaders in end of life care can mentor the newest nursing professionals, the next generation and future leaders, to listen to a person’s anguish, really hearing their story; provide a sense of love and acceptance to a patient and family, whoever they are; and be the presence needed in a patient’s journey of dying. This entry was posted in end of life care, nurses are heroes and tagged hospice nurse, love. Bookmark the permalink. 2 Responses to LISTEN. LOVE. BE. You’ve captured the essence of everything I know about the hospice nursing teams I support. May I reblog this post on my own website Amy?